PRESIDENT Emmerson Mnangagwa Friday exposed Zanu-PF national chairperson Oppah Muchinguri-Kashiri's lies concerning the conspicuous absence of Vice President Kembo Mohadi at a party conference in Esigodini. In her opening remarks, Muchinguri-Kashiri told 6,000 Zanu-PF officials gathered at Mzingwane High School in Esigodini that Mohadi, whose Matabeleland South province is hosting the conference, was away on assignment, hence his failure to attend the ongoing 17th Annual National People's Conference at Mzingwane High School. 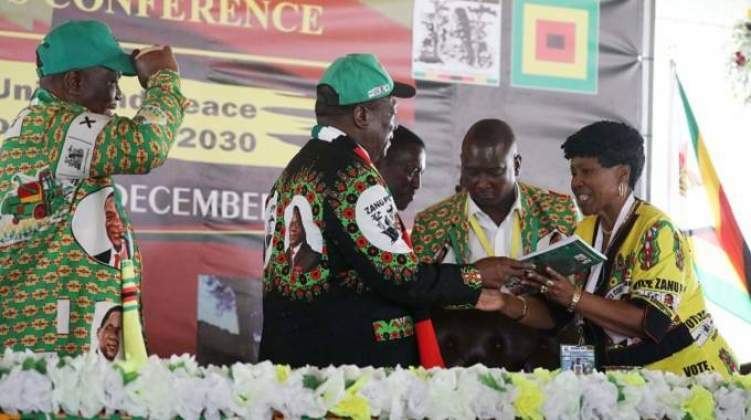 "Vice President Mohadi has asked his counterpart Vice President Constantino Chiwenga to introduce President Mnangagwa to the delegates," Muchinguri-Kashiri said. "By virtue of him being from Matebeleland South province, VP Mohadi was supposed to introduce the President but he is attending another government business." But Muchinguri-Kashiri's claims were quashed by Mnangagwa during his salutations, much to the chagrin of the country's Defence Minister. "We do not have him here. The national chairperson has told us that he has been sent somewhere. No, no, that is not correct. He is busy but he was saying if his health improves he might join us. He is in Harare," said Mnangagwa. VP Mohadi has been unwell in the recent past. The 69-year-old veteran politician spent over a month in South Africa after he reportedly suffered leg injuries following a blast during a Zanu-PF rally at White City Stadium in Bulawayo June this year. As the most senior Zanu-PF leader in the host province, the former State Security Minister was expected to take centre stage during proceedings.